← The BBC “WW1 at Home” event. The “Fawn” – hopes, a near disaster and disappointment. Picture the scene: a group of men meet at the Star Cocoa Rooms in Rhyl. It is May 1890 and the group are keen to return to the heady days when steamers used to ply between Rhyl and Liverpool. In the Chair at the meeting is Mr Robert Jones (boat builder). A decision is made at the meeting authorising Mr S.J.Hughes (of Tyn y Coed, Church Street and promoter of the scheme) to call on tradesmen and others to solicit support. The atmosphere is likely to have been one of hope, excitement, trepidation and nostalgia. By July a company had been registered with the title “The Rhyl and Vale of Clwyd Steamship Company”. What they needed now was a boat. A registered packet service between Liverpool and North Wales was established as early as 1821. 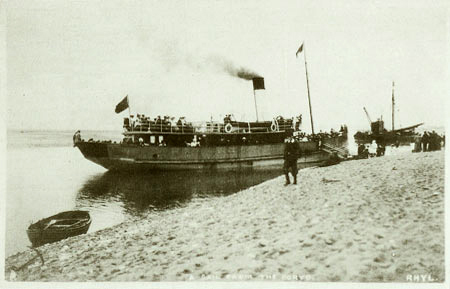 Originally sailing into Bagillt, by 1829 the terminus had moved to Rhyl. 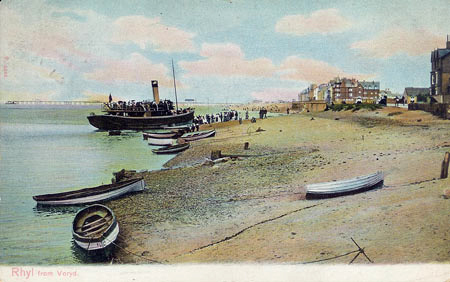 By the late 1850’s it had also become profitable to run summer excursion trips to Llandudno. The early 1860’s marked the highest point in Rhyl’s steamer trade, but its glory was brief, and by the mid 1860’s the steamer trade began to decline. 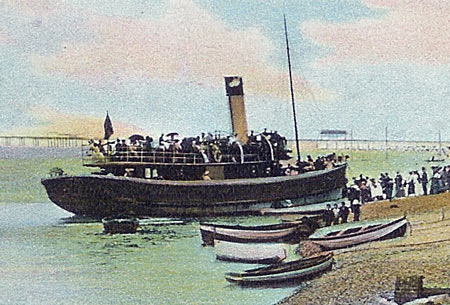 The Foryd steamers did receive a boost in 1867 with the opening of the pier when passengers for Rhyl could also be landed at the town itself. They could also be picked up and landed at much lower states of the tide. However, steamer trade to Liverpool continued to decline almost completely, due to a combination of slow boats, high fares and competition from the railway. There were also problems at the Foryd with the river silting up. A large crowd gathered to greet the “Fawn” when she arrived in Rhyl at 9pm on Saturday, December 27th, 1890. It was low water when she arrived and she was unable to enter the Foryd. However, such was the impatience and excitement of some of the directors and shareholders that they went out to inspect her in rowing boats. In March 1891 the “Fawn” passed her Board of Trade survey which allowed her to carry passengers and cargo. By April she had been placed on a commercial footing and was charging 25% less than the railway for carrying goods to Liverpool. Now conjure up in your mind the following course of events: You are one of fifty passengers leaving Liverpool for Rhyl on the “Fawn”. You may know that the regular, experienced Captain Williams has been replaced by the less experienced Captain Griffiths, due to illness. It is August but it’s feeling very windy and a gale has been reported from Holyhead. You are feeling uneasy after passing New Brighton when the full force of the gale is felt. Perhaps alarm is creeping in despite the Captain’s reassurances. Maybe, when the “Fawn” eventually passes Rhyl pier at 10pm you begin to feel some relief. However, the seas were heavy, the wind was high, the night was very dark and Captain Griffiths missed the entrance to the Foryd harbour. To avoid becoming stranded on a pebble bank, he altered course but was too near the outer buoy and its chain entangled with his propeller. The “Fawn” was stuck fast on the most open and vulnerable part of the coast. The passengers were in a state of near panic, hymns were sung and prayers offered. As midnight approached distress rockets were fired and the ship’s whistle was blown repeatedly and loudly. Eventually the steamer “Hercules” replied to the whistle. The sound of whistles from two steamers awoke many local people, the lifeboat rockets were launched and more people assembled. When the lifeboat approached the “Fawn” it sent up a green rocket illuminating a scene of much grandeur. When the lifeboat could finally get alongside the ship the cheers on board could be heard onshore. The passengers were all safely brought ashore and by the next tide the “Fawn” was able to enter the Foryd and resumed her advertised schedule.